Welcome to Classes & Careers! Our goal is to help you prepare for a better career by giving you helpful online degree information and connecting you with accredited online colleges. Get Started. 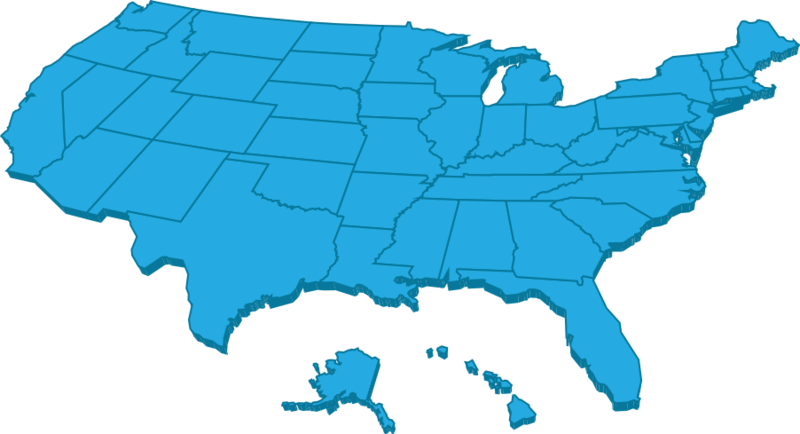 There are 57 U.S. online colleges that offer only online classes and degree programs. 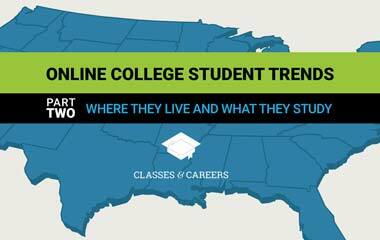 A little over 50% of all U.S. colleges and universities offer online classes and degrees. Nearly 31% of college students (6.4 million) are taking at least one online class compared to 11% (1.6 million) in 2002. About 14.6% (3 million) of all college students are taking 100% of their courses online. Online college enrollment grew by 17% between 2012-2016 despite overall higher education enrollments dropping by 4.4% in that same time period. 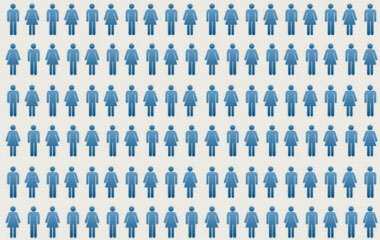 The number of programs and classes offered online are increasing. Over 12% of college programs in the U.S. are now offered online. Additionally, about 50% of colleges now offer online courses. Of those colleges, 47% offer undergraduate-level online courses and 25% offer graduate-level online courses. Online classes are rated similarly to traditional classes. In 2015, 71% of surveyed academic leaders rated online education as good or better than traditional face-to-face instruction given through on-campus classes. Salary data from the Bureau of Labor Statistics suggests that the more you learn, the more you may be able to earn. Graduates with a bachelor’s or master’s degree degree consistently have higher average annual salaries than those with an associate degree or lower. Unemployment data shows that the possibility for unemployment decreases as an individual gains education and training. Those with only a high school diploma or equivalent average a 4.6% unemployment rate, whereas those with a bachelor’s and master’s drop in unemployment averages to 2.5% and 2.2% respectively. Employment data from the Bureau of Labor Statistics highlights the accelerated growth of jobs that require a college education. During the last 10 years, new jobs that require a college degree or certification dramatically outpace the growth of jobs that have no requirement or only require a High School diploma. A survey by the Bureau of Labor Statistics found that for workers 25 years of age and older, a growing percentage have a college degree equaling an associate, bachelor’s, or higher. According to poverty levels and education attainment survey data gathered by multiple government agencies, the more education parents attain, the less likely they and their children are to live in poverty. Bachelor’s degree holders receive many benefits compared to high school graduates who have not attended college. They are more likely to have good health, health insurance and retirement plans, and less likely to be divorced or in prison. Online classes are a convenient way to complete college courses or even work on a degree, especially if you have a full-time job, a family, or other responsibilities. 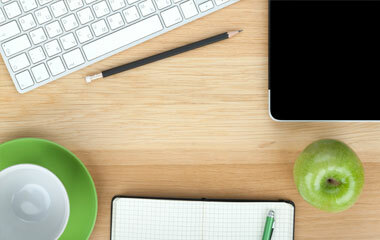 If you’d like to learn more about online classes, this guide is a helpful resource. Did you know that online enrollment numbers have increased by 17%, despite overall higher education enrollments dropping by 4.4%? 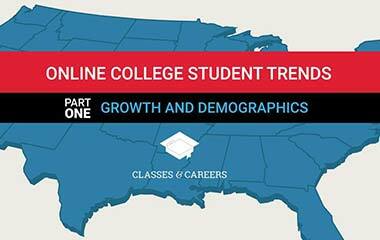 See the growth statistics and current demographics of online college students. 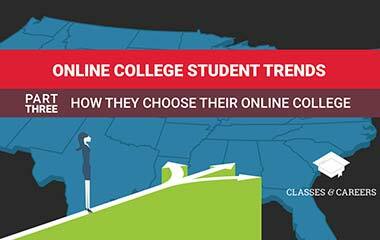 Over 3 million college students in the U.S. take 100% of their classes online. Find out where online undergraduate and graduate students live, what their preferred areas of study are, and how they use mobile devices in their online college search and studies. Did you know online college students request information from an average of 2.7 schools and that 61% enroll at the first school that responds to them? See how students choose their school and why. Have you considered getting your degree from an online college? 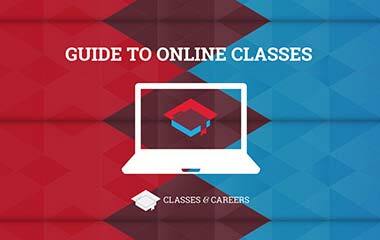 Before you do, find out what students want to know most about online classes and see if getting your degree online is a good fit for you. Approximately 3 million students enroll in some form of higher education each year. Unfortunately, not all of them stick with it. Find out the main reasons students drop out. Choose a Degree Level. Choose an Area of Study. Get Matched to Schools. Earning a college degree is a worthwhile goal. Yet, life doesn’t always make it easy. Is it possible that seemingly more pressing life priorities and family responsibilities have pushed your dreams of earning your degree further out of reach, making it seem distant and unattainable? Maybe finances are keeping you from finishing your degree or job and family duties make it seem impossible to have the time to even consider getting back into the classroom. Whether you are looking to get the degree that’s necessary to apply for your dream job or you just want to expand your current training and increase your salary potential, online classes and degree programs make the benefits of earning a college degree available to everyone. Online colleges offer online certificate, associate, bachelor's and master's degree programs in criminal justice, nursing and healthcare, psychology, education, and business. These are just a few of the opportunities that are open to you. An additional bit of good news is that there are accredited online colleges that offer degree programs that are approved by national and regional accrediting agencies. In some fields, earning a degree from an accredited program is a requirement to start working professionally. If competing priorities make the idea of earning your degree hopeless, it’s time to consider choosing an online college. You may find that the flexibility of online learning can allow you to maintain your lifestyle and meet your financial and career goals. At Classes and Careers, we have made it our job to do higher education research, provide you with up-to-date degree and college information, and connect you with the online colleges and universities that have the degree programs you want. If you're unsure of what you want to study, that’s okay. We have degree information that can help you get a feel for different careers and which degrees are needed to get into those career fields. As a resource that has relationships with accredited online colleges and traditional colleges and universities, our collection of tools and content can empower you with the knowledge you need to make informed education decisions. In addition to our college blogs - Education Today and College Advisor we offer a College Search Tool that allows you to quickly access and search our database of accredited schools and certificate or degree programs. Explore online colleges like American Intercontinental University (AIU), Kaplan University, Altierus College, Berkeley College, Post University, Full Sail University, Beckfield College, Liberty University, Colorado Technical University (CTU), Argosy University, and Grand Canyon University (GCU). Based on your location, current education level, and desired area of study (i.e. major), you will quickly find school and degree results tailored to your needs. We believe and hold true to the ideal that the opportunity to earn a college degree should be available to everyone. Due to many external limitations, that is unfortunately not always the case. Thankfully, with the increase of online colleges, online classes, distance learning degree programs and greater financial aid and student loan options, most of these obstacles can become small speed bumps. Allow Classes and Careers to be your first stop on your road to an educated future with hopeful career options. Use our degree and school search tools to research your online college options! We hope to help you, another motivated future student, make the decisions necessary to reach your goals. Click on the button to use our FREE Online Degree Finder Tool.